Re tipping and Re taping Hair Extensions UK. Braids Dreadlocks and Natural hair in Manchester. Our services are suitable for all hair types and textures. We make sure that the expert advice given to our clients is to promote hairloss prevention and the management of ongoing hairloss issues. 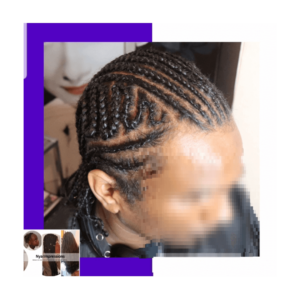 Braids, dreadlocks and natural hair in Manchester and Cheshire. ​Do you struggle to find a stylist who has expertise in natural hair? ​Do you worry about tight ill fitting braids, dreadlocks and natural hair styles? Fear not, as we have a wide range of products suited for all hainr types. Including Natural, vegan friendly, curly girl and silicone free. We are natural hair experts in all European, Asian & Afro textured hair. We will perform a consultation to see which style is best suited without causing damage or hairloss. Additional £5 per half hour will be added if the styles takes longer than the time stated. ​Hair Loss and Hair Breakage sufferers please book in for a Hair Analysis Consultation. Wash, condition and blowdry -£30 for up to 2hrs. What are Swiss Lace Wigs? Copyright. All rights reserved. Proudly powered by WordPress. Theme: BC SHOP by aThemeArt.